Machop in game: 15,890 Who? Important notice! Pokemon Machop is a fictional character of humans. Machop (Japanese: ワンリキー Wanriky) is a Fighting-type Pokémon introduced in Generation I. It evolves into Machoke starting at level 28, which evolves into Machamp when traded. 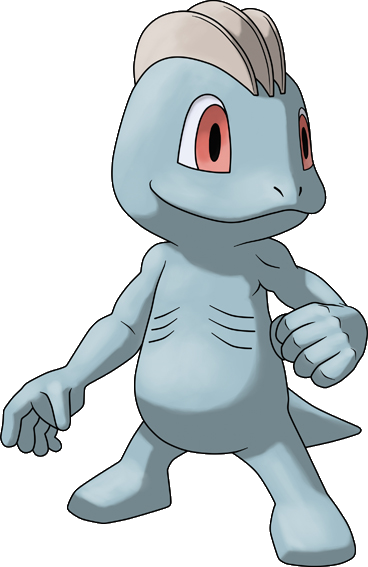 Machop is a humanoid, bipedal Pokémon that has gray skin. There are three brown ridges on top of its head, and it has large red eyes and relatively flat face. Its chest has three, thin, rib-like stripes on either side. Its feet appear to have no toes, while its hands have five fingers. It has a short, stubby tail. Machop's entire body is covered with muscles that will never tire or cramp. With these muscles, it can lift many times its own body weight. It spends its time and energy practicing all different forms of martial arts and trying to improve its abilities. Machop lives in the mountains. 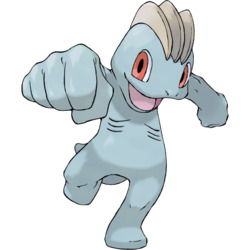 Machop first appeared in The Punchy Pokémon. This Superpower Pokémon was the first opponent for Ash's Primeape in the P1 Grand Prix. A Machop appeared with a Machoke in Pop Goes The Sneasel. These Pokémon were protecting the flame of Ho-Oh both with Sneasel. Dewford Gym Leader Brawly used a Machop to battle Ash in Brave the Wave and Just One of the Geysers. Machop was in Sitting Psyduck. Emily had a Machop, Machoke and Machamp chase after her runaway Psyduck. A Machop was seen in a Pokémon Lab in Riddle Me This. 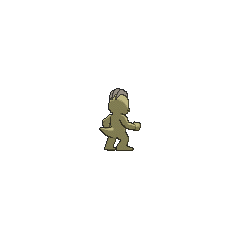 Machop appeared in Pikachu's Rescue Adventure as one of the wild Pokémon who help the Trainers' Pokémon and Elekid save the Exeggcute nests and Togepi in a storm. 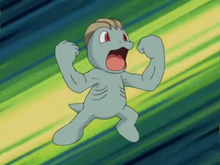 Machop also appeared in The Power of One. A Machop appeared in Pokémon Double Trouble. Two Hits and a Miss featured a Fighting-type dojo where one of the many Pokémon was a Machop. A Machop appeared in A Better Pill to Swallow as a fantasized Pokémon. A Machop was one of the Pokémon seen at Chuck's Gym in Machoke, Machoke Man!. A Machop appeared in Spontaneous Combusken!, To Thine Own Pokémon Be True!, and SS028. A Trainer's Machop appeared in The Journalist from Another Region! participating in the Pokémon Sumo Tournament. A Machop appeared in a flashback/fantasy in The Forest Champion!. A Machop appeared in a flashback in When Light and Dark Collide!. Three Trainers' Machop appeared in Alola to New Adventure!. Three Trainers' Machop appeared in SM006. Two Trainers' Machop appeared in SM013, where they participated in the Pancake Race. EP029 Machop Ash's Pokédex Machop. Its body is pure muscle. Its special attack is the Seismic Toss. AG020 Machop May's Pokédex Machop, the Superpower Pokémon. Machop have muscles that never tire no matter how much they exercise. Machop have enough strength to throw 100 average sized adults. Machop debuted in a flashback Long Live the Nidoqueen!? under the owner ship of Harry. Bruno owns several Machop which first appeared in Karate Machop!. These Machop were sent to attack Kanto alongside several other Elite Four Pokémon. A Machop appeared in Querulous Qwilfish, aiding the construction of the Battle Tower. Machop was also seen in Pokémon Adventures as one of Brawly's Pokémon, which he sent out against Sapphire's Combusken, but ended up overwhelmed by its speed. Much later, in Volume 20, Brawly is shown to own a Machoke, which seems to be this Pokémon's evolved form. Yuki in the Pokémon Gotta Catch 'Em All manga owns a Machop. A Machop appeared in Pocket Monsters HeartGold & SoulSilver Go! Go! Pokéathlon. Giovanni's Machop briefly appeared in Get The Last Badge!! along with its evolved form. One Machop figure has been released. Loves to build its muscles. It trains in all styles of martial arts to become even stronger. Very powerful in spite of its small size. Its mastery of many types of martial arts makes it very tough. Its whole body is covered with muscles, so it can raise bulges anywhere. It can throw a hundred adults. It loves to work out and build its muscles. It is never satisfied, even if it trains hard all day long. It trains by lifting rocks in the mountains. It can even pick up a Graveler with ease. Machop's muscles are special - they never get sore no matter how much they are used in exercise. This Pokémon has sufficient power to hurl a hundred adult humans. It continually undertakes strenuous training to master all forms of martial arts. Its strength lets it easily hoist a sumo wrestler onto its shoulders. Its muscles never cramp however much it trains. It lives in the mountains away from humans. Though small in stature, it is powerful enough to easily heft and throw a number of Geodude at once. Machop's muscles are special—they never get sore no matter how much they are used in exercise. This Pokémon has sufficient power to hurl a hundred adult humans. With its superhuman strength, it's able to throw a hundred people all at the same time. Its strength comes from lifting Graveler every day. Moves marked with a superscript game abbreviation can only be bred onto Machop in that game. 51%-100% HP I'd fight even against a hundred foes! 26%-50% HP Groan... Half my HP's gone. Level up Oh, yeah! Leveled up! Makes me happy! Machop packs a lot of power in its small body. It can easily shatter small Rocks. It attacks by punching and launching orbs of aura power. 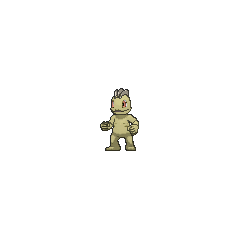 For other sprites and images, please see Machop images on the Bulbagarden Archives. Before the release of the English versions of Pokémon Red and Blue, Machop was known as "Kara-Tee". This name is a corruption of karate, a fighting style. Machop and its evolutions have been in all Japan-centric regional Pokédexes. Machop appears to be based on a bodybuilder. It also possesses some reptilian features, including 3 plate-like crests on its head and a dull-gray coloration. Machop may be a combination of macho (Spanish and Portuguese for overly male or chauvinist) and chop. Macho has come to mean tough or masculine in English. Akin to Mr. 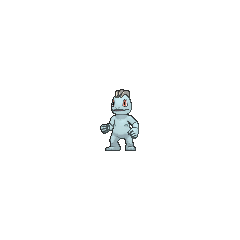 Mime, the masculine attribute has no reflection on gender assignment, as both species can be male and female; however, Machop's evolutionary line does have a 3:1 male:female ratio, making the species predominantly—but not entirely—male. The name may also be somewhat-related to the synapsid moschops, which has a vaguely similar-looking face. Wanriky is a combination of the on'yomi readings of 腕 wan (arm) and 力 riki (strength). Cantonese Chinese 鐵腕 Titwún Literally and figuratively means "Iron wrist"
Mandarin Chinese 腕力 Wànlì Literally "Wrist strength"